NOTE: This page is for purchasing an advanced share in the 2019 Turmeric Harvest, which begins in October 2019. What is the "Turmeric Edition"? When you participate in the Windcrest Farm CSA - Turmeric Edition, you are purchasing a share in our 2019 fresh baby turmeric harvest, which begins in October 2019. Now is the time of year when we purchase the premium certified organic, certified disease-free seed for next year's crop. By purchasing a share, you are helping us cover the early production costs of this unique product. That means that when you purchase a 1 lb. share of turmeric for $18, you get 1-1/2 lbs of turmeric - a $27 value! You save $9! Note: Shares are limited to 3 shares per person. This will be our 8th year growing fresh baby turmeric and each year we sell out quickly. Here's your opportunity to be at the top of the list for our 2017 fresh turmeric harvest. In 2019 Windcrest Farm offers Red Hawaiian Turmeric which has a sweet taste and Indira Yellow Turmeric, an Indian variety perfect for authentic Indian style spice blends (like masalas or curries). Indira Yellow has bright yellow interior and a more assertive turmeric flavor. (Sorry, our White Mango Turmeric is sold separately and not available through this CSA plan). These bright, juicy rhizomes are different from the mature turmeric found in supermarkets - there is no rind to peel and they are tender instead of tough and woody. Turmeric has been used as a culinary and medicinal spice for thousands of years in Asia and India. This remarkable spice can be easily added to your daily diet. Turmeric is a member of the ginger family, native to tropical South Asia, and known for its orange-yellow color. It is widely used in South Asian and Middle Eastern cuisine as well as for coloring foods such as mustard, cheeses and butter and for dyeing fabrics. World Healthiest Foods describe the taste of this spice as peppery, warm and bitter but with an aroma similar to ginger. Its taste has also been described as a bitter ginger with peppery and floral tones. Fresh turmeric is milder in flavor than the mature rhizome. I combine grated turmeric with ginger and garlic for most dishes. Turmeric contains an active ingredient called curcumin, which is an antioxidant and anti-inflammatory compound. Studies found that a daily dose of 2 grams of curcumin provided the pain relief equivalent to a dose of ibuprofen. In addition to pain relief, particularly for arthritis, turmeric has been studied for the prevention of Alzheimer's disease and in the prevention and treatment of cancer.Dr. Oz says, ""...in India, where turmeric is widely used, the prevalence of the four most-common US cancers is 10 times lower. Researchers attribute this, in part, to curcumin...". "Turmeric has been used in traditional medicines for easing the pain of sprains, strains, bruises and joint inflammation, as well as for treating skin and digestive issues. The healing power of turmeric comes from its active ingredient - curcumin, which lowers the levels of two enzymes in the body that cause inflammation." Regarding Alzheimer's, Dr. Oz says, "UCLA researchers have demonstrated curcumin's potent antioxidant, anti-inflammatory, and anti-amyloid properties (beta-amyloid protein is the sticky "goo" that accumulates on the brain and prevents neurons from "talking" to each other; too much beta-amyloid is believed to cause Alzheimer's symptoms) - effects that are believed to protect the brain from Alzheimer's disease." Dr. Andrew Weil agrees that turmeric is helpful in the fight against Alzheimer's: "The good news about this cross-cultural spice is that elderly villagers in India, who eat turmeric in their daily curries, have the world's lowest rate of Alzheimer's disease." How do you store fresh turmeric? Fresh turmeric can be stored in the refrigerator for several weeks by making sure the rhizome is dry, wrapping it in a paper towel and placing it in a plastic bag. It can also be frozen for up to a year - either whole for grating frozen, or in pieces to add to for smoothies, juices and cooking. Remember, turmeric is used as a colorant and the orange-yellow color can stain hands, cutting boards and clothes! � Pickle fresh turmeric root in vinegar and lime juice for a tasty Asian-style condiment. � Add a few teaspoons of grated turmeric to Basmati rice and a little coconut milk and water. Fresh Culinary Certified Organic Baby Ginger is available beginning in September 2017. What is Windcrest Farm Fresh Baby turmeric and how is it different from the turmeric I see in the store? "Baby" turmeric is harvested before the rhizomes form the tough brown skin of mature turmeric (the turmeric you find in the store). The taste of baby turmeric is milder than mature turmeric. It is a uniquely local product. 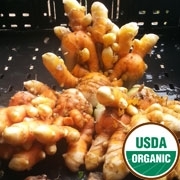 Windcrest Farm Baby Turmeric is fresh, local and USDA Certified Organic and not shipped from overseas. How long will baby turmeric be available? Turmeric is harvested just before the first frost in autumn and is available until supplies are gone. Do I have to peel my baby turmeric before using it? No need to peel your fresh turmeric as you would mature turmeric. Simply use a wet paper towel and gently wipe the rhizomes to remove any scales or soil. How do I store fresh turmeric? Fresh turmeric can be stored at room temperature for up to two weeks and in the crisper section of your refrigerator for up to three weeks. Storing it in a bag or container will keep the turmeric from forming a slight skin. Once refrigerated, keep turmeric in cold storage or it will become "limp". Even if it loses some crispness, it is still quite usable and delicious. We recommend freezing your turmeric to preserve it for up to a year. How do I freeze fresh turmeric? Fresh turmeric can be frozen, stored for up to a year and used when needed, right from the freezer. Freeze minced or thinly sliced ginger in individual portions or in bulk. Freeze an entire rhizome, grate what you need and return the frozen piece to the freezer. It is very important to return unused frozen turmeric to the freezer immediately or it will become "mushy". If you forget to put it back in the freezer and end up with watery, mushy turmeric rhizomes, place them in a food processor or blender and puree. Store the puree in the refrigerator for up to three weeks or dehydrate it to use as a turmeric powder. Can I plant the baby turmeric rhizomes to grow my own turmeric? No, this turmeric has been harvested before it has matured enough to be used as seed. I would love to grow turmeric myself. Are "seeds" or plants available? Seed rhizomes are available in early spring. Because turmeric is a tropical plant with a long growing season, turmeric seed rhizomes must be "pre-sprouted" in a very warm (70-80 degrees) greenhouse chamber in late February for harvest in late October/November. When the soil temperature reaches a constant 55 degrees, turmeric is transplanted into the ground. turmeric plants require frequent, high nutrient feeding, consistent watering and have little tolerance for weeds. Windcrest Farm will have pre-sprouted turmeric seed available for sale in late Spring 2019. Our USDA Certified Baby Turmeric Harvest begins in October 2019. Purchase your Turmeric CSA Share now and receive 1/2 lb of turmeric FREE with your Share in October 2019. Limit 3 shares per CSA order.